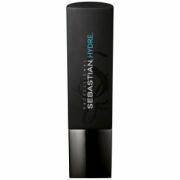 Sebastian Volupt Shampoo is a volume boosting cleanser that lets you achieve great hair heights. Formulated with revolutionary Cushion Particle Technology, Volupt Shampoo delivers exceptional volume and thickness without any unnecessary weight, residue or dry sensation. Volupt Shampoo constructs harmony of volume and impeccable softness to your hair whilst shielding in colour and texture. Volupt Shampoo enhances the hairs softness by up to 45% and leaves the hair with enviable body, volume and soft movement. Rinse thoroughly. remove excess water.